Great city centre location and offering a free parking facility. The hotel is within easy walking distance of shops, bars and restaurants. The airport is just 6 miles away and the ferry port under half a mile. There is on-site Thyme restaurant serving quality fresh meals. Book direct for the best Premier Inn Aberdeen deals. Located just 2 miles from the centre of Aberdeen on the A90, and within easy reach of the train, ferry and airport. Free on-site parking and good pub restaurant. Book direct for the best Premier Inn Aberdeen deals. On the A90 North, on the main route from Aberdeen to Peterhead and Fraserburgh, close to Murcar Golf Course. Table Table restaurant provides excellent fresh quality meals throughout the day and there is free parking. 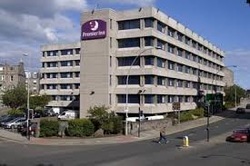 Book direct for the best Premier Inn Aberdeen deals. Located just off the A90 to Aberdeen. Portlethen Railway Station is just half a mile away, close to Dunnottar Castle, Storybook Glen and Duthie Park Winter Gardens. Facilities include Brewers Fayre restaurant and free on-site parking. Book direct for the best Premier Inn Aberdeen deals. On the A944 to Alford, less than 8 miles (13 km) from the heart of Aberdeen's city centre, close to both the Arnhall business park and Westhill industrial estate, with free parking and spacious, comfortable and modern rooms. There is an on-site pub restaurant.Book direct for the best Premier Inn Aberdeen deals.